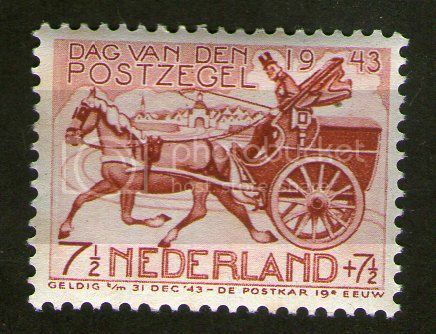 Show your nice Horse-drawn Stamps here. depicting the Leipzig spring fair. I like this nice Engraving. 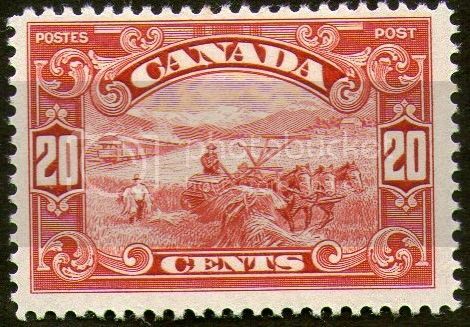 Canada 1928 20c lake. 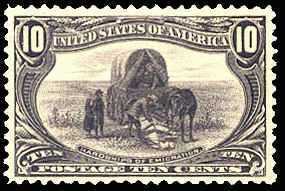 Entitled “Hardships of Emigration,” the stamp pictures a family traveling across the prairie in a covered wagon. One of the horses has collapsed and the man is trying to revive it. The scene is based on a painting by Augustus Goodyear Heaton. 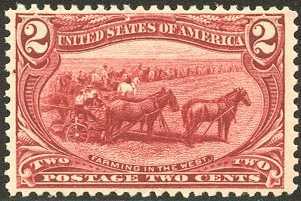 The 2¢ Trans-Mississippi Exposition stamp entitled “Farming in the West” pictures a team of horses plowing a wheat field. The design is based on a photograph taken in the field of the Amenia and Sharon Land Company, a 27,000 acre “bonanza farm” in North Dakota. Bonanza farms were very large operations that grew and harvested wheat on a large scale. The scene was originally designated for the $2 stamp. However, officials believed the photograph was the best representation of the “Western” theme they planned for the Trans-Mississippi stamp series. Therefore, a change was made to place it on the 2¢ stamp where it would see much greater use. The first four Parcel Post stamps with the lowest denomination feature Postal Service employees at their jobs. 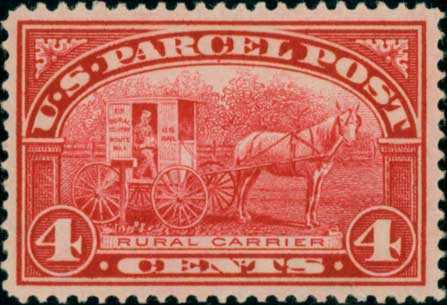 The mail carriers in rural areas used horse-drawn wagons to deliver the mail. 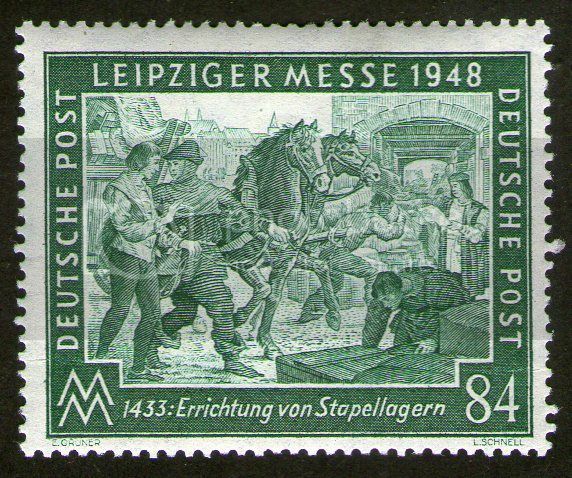 A mail wagon from the Post Office Museum in Washington was the model for this stamp. The 4¢ stamp was issued on December 12, 1912, about 77 million of these stamps were printed. 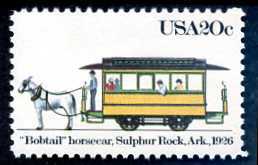 This stamp is part of a set of four featuring America's first form of mass transportation. The first streetcar, the "John Mason," resembled a small railroad car with a seat, and it was pulled by horse. Electric Streetcars were introduced in Montgomery, Alabama, in 1886. "Bobtail" was the last horse-drawn streetcar to be removed from service. The St. Charles Streetcar in New Orleans is the oldest line still operating today. 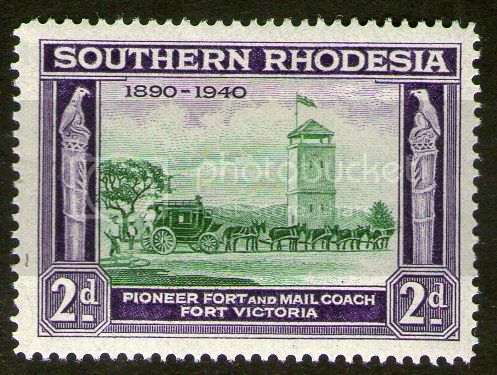 Pioneer Fort and the Mail coach Fort Victoria. Thank's for sharing, sixty-one horses is a lot of horse power. 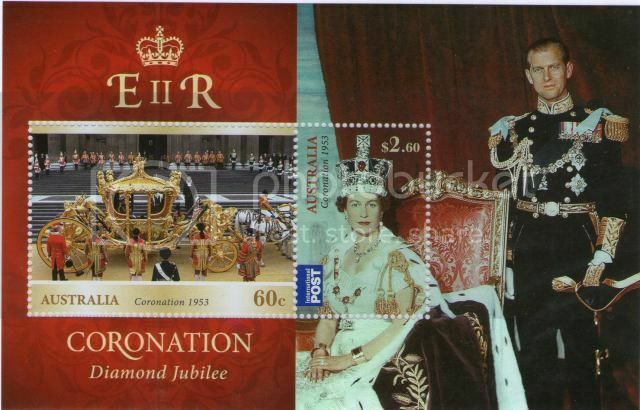 Australia 2013 Queen's Birthday minisheet. Great new thread, thanks for starting this. 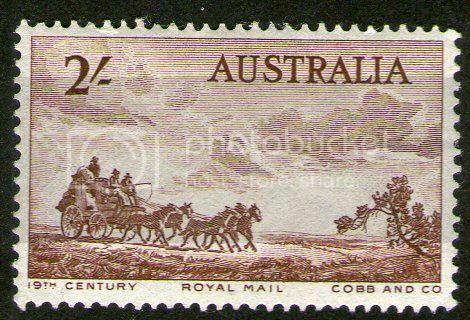 A 1989 Australian stamp showing an 1878 horse-drawn tram in Adelaide. Wow, I missed this thread when it first came out. Thanks for reviving it, michaelcayley! When I read the thread title, I was wondering how artistic a horse could be?!? Then when I saw the stamps... duh. Wow, I missed this thread when it first came out. Thanks for reviving it, michaelcayley ! 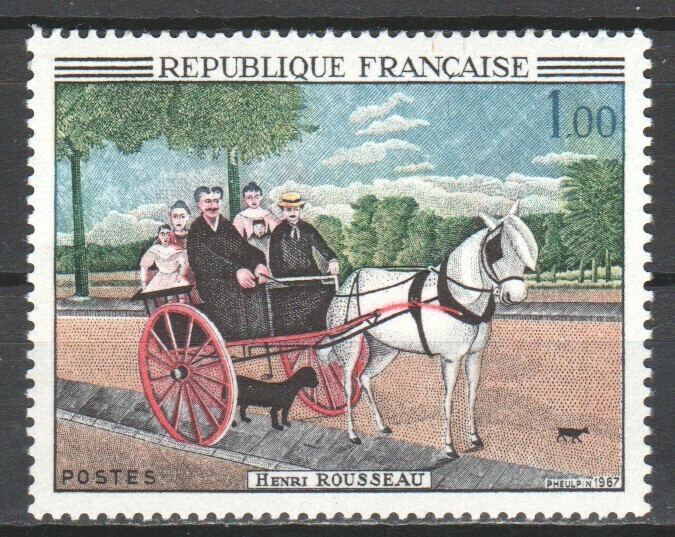 A painting called Old Juniet's Trap by Henri Rousseau (1844-1910) on a 1967 French stamp. Rousseau is often known as "le Douanier" (the Customs official) because he had a government job collecting tolls on goods entering Paris. Best-known for his paintings of jungle scenes, he also depicted ordinary French vistas and life, particularly in Paris suburbs. In his lifetime, partly because of his fairly naive style, his art was ridiculed by some critics, though others recognised his genius and some major painters admired his output. Picasso found one of his paintings on sale in the street purely as a canvas to be painted over and was immediately inspired to introduce himself to Rousseau. Henri Rousseau died from a blood clot following an operation on his leg. There was a retrospective exhibition in the year after his death. Major exhibitions were put on in 1984-5 (Paris and then New York), 2001 (Tubingen, Germany), and 2005-6 (London and then Washington DC). The American poets Wallace Stevens and Sylvia Plath wrote poems inspired by Rousseau paintings, and one of Joni Mitchell's songs, The Jungle Line, is based on a Rousseau painting. 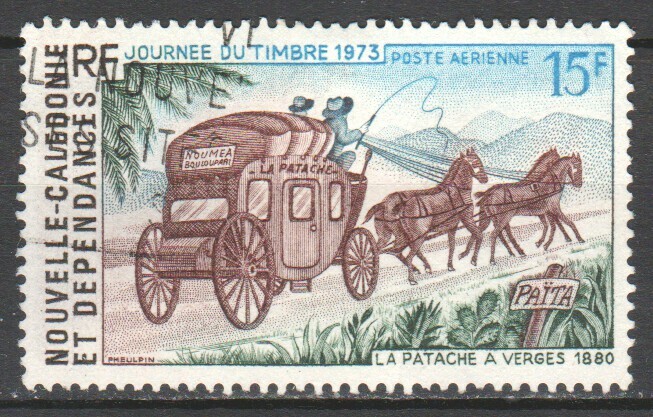 A stamp issued by New Caledonia for the 1973 Stamp Day, showing a mail coach of 1880.